The Type 97 was a Japanese tankette used in the Second Sino-Japanese War, at Khalkin-gol (Nomonhan) against the Soviet Union and Mongolia, and in World War II generally. It was classed as a light armoured car even though tracked. It is a small vehicle and was designed as a fast reconnaissance vehicle. They were designed in 1937 and a total of 616 of them were built. As I mentioned, they were small, only being large enough for a crew of two (a commander and a driver). The armour was between 4-16mm thick and the armament was a 37mm Type 94 gun. The vehicle itself was capable of a speed of up to 42 km/h and had a range of about 250 kilometres. The vehicles being painted have been based, then base coated in Army Painter brown, then covered in a desert sand colour before doing the yellow contrast stripes. 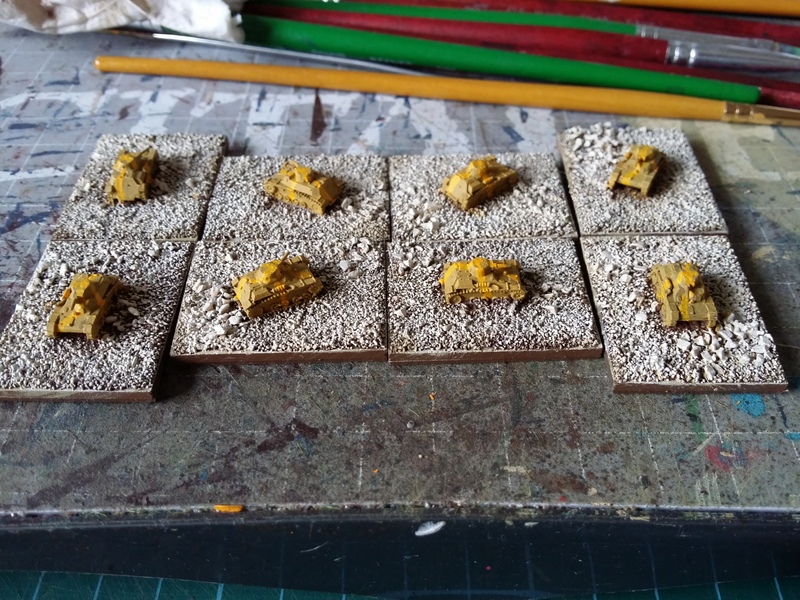 Some green, brown, rust and dark earth with a dark brown wash and then some weathering to finish them off will see the armoured component of the Japanese finished leaving two aircraft and the infantry to do.